Use these 16x12 saltbox shed plans to build the perfect size shed that makes a great garden shed, and has lots of space for storing all your garden tools and your riding lawn mower. Your instant download comes with a comprehensive building guide and detailed plans, materials list to use for shopping or handing to your lumber professional for a quick total materials estimate and delivery set-up. 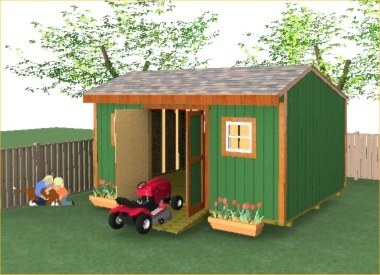 16x12 Saltbox Shed Plans only $6.95! 9.5' to 10' Tall depending on type of foundation you build. Floor Joists 12" on center. Walls and roof framing 2' on center. Plans recommend LP Smartside pre-primed siding. This tool shed can be built on a concrete slab, or with a wooden skid foundation resting on a bed of gravel, or a skid foundation anchored to the ground with 4"x4" piers. These plans show the construction for the latter method using the post and pier anchor method. These plans are in pdf format and are instantly downloadable by using the 'Buy Now' button below. All purchases are made through paypal and you do not need a paypal account for the purchase. After buying, you will immediately receive a link to download the plans. If for some reason you don't get the link then your email has probably treated the link as spam or junk email. If you encounter any problems what so ever with getting the link please email me at shedking.net. I can attach the plans to the reply email for you. Leave garden tool shed for storage shed plans.